Jaipur is a beautiful city filled with a pleasant environment to live, work and have a good life. There is so much to this city in the state of Rajasthan other than what meets the eye. The real estate industry in Jaipur has evolved in Jaipur with a number of residential and commercial projects in different parts of the city and its outskirts as well. Mahima Bellevista is a new residential project in Jaipur by the well-known real estate company, Mahima Group. Extended over luscious acres of land, this development consists of 3 premium towers (G +13) that are crafted to delight and offer 2BHK, 3BHK luxury apartments of different configurations that are Vaastu-compliant. With area sizes starting at 897 sq. ft. and going up to 1396 sq. ft., luxury space is what you can expect in every apartment. Focusing in modern-day living, this development offers internal and external amenities that are simply extravagant. The apartments are high on space and contain vitrified flooring, main doors with tough wooden frames and windows providing landscape views of the Aravali mountains, elegant kitchens with granite tops, OBD paint on all internal walls, electrical ports located perfectly for all electronics, high-end fittings and furnishings, safety features, etc. The external amenities at this development are simply flawless and include a clubhouse for recreation, swimming pool, sports facilities and a play-area for kids, gym, jogging track, dedicated area for senior citizens, efficient power back-up for emergencies, well-planned car parking facility, gorgeous landscape garden, 3-Tier security with video surveillance and lush open greens. It is safe to say that this development offers something for everyone to live a modern-day lifestyle filled with luxury and comfort from head to toe. 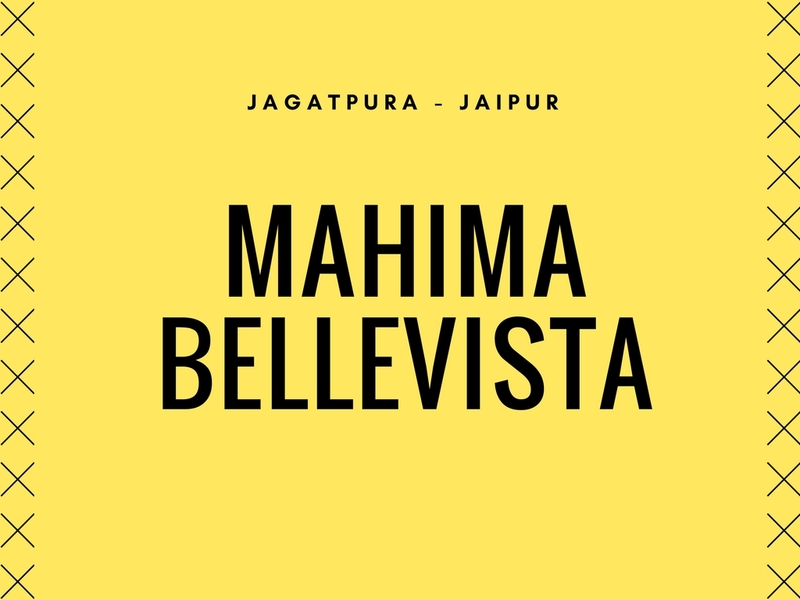 Located at Jagatpura in Jaipur, Mahima Bellevista Jagatpura offers easy access to several places like schools, hospitals, medical centres, malls, restaurants, cafes, shopping centres, general stores, banks, ATMs, public transport and more. When all that you need is just around the corner, experience a world of convenience like no other. Starting with a price tag of Rs.29.57 lakhs and gradually moving up to Rs.45.03 lakhs, the Mahima Bellevista price is exclusive and totally affordable. Rarely do you find a magnificent development like this at a low cost! Without a doubt, an apartment at this development is definitely worth a purchase. There are multiple payment options to choose from along with home loans at decent interest rates, NRI services and more.